Aquamarine Pearl Diamond Bracelet Sterling Silver- 7'' Length by Nadean Designs at Nicky's Blog. Hurry! Limited time offer. Offer valid only while supplies last. Welcome to Nadean Designs . 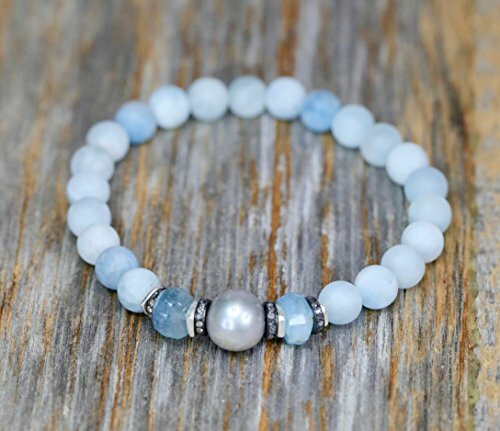 This is an elegant refined simple and modern matte Aquamarine Gemstone Bracelet with a large Silver genuine pearl focal.
. This is an elegant refined simple and modern matte Aquamarine Gemstone Bracelet with a large Silver genuine pearl focal. This lovely March birthstone bracelet has 4 pave diamond accents set in oxidized sterling silver and 2 faceted vintage cut aquamarine freeform rare gemstones. Fine Hill Tribe ( 99% pure) silver completes the design. Note: Each bracelet will be slightly different, as with all natural gemstones no two bracelets will be 100% identical as they are handmade individually. They will be matched as closely as possible to each other and the photographs. If you have any questions about this product by Nadean Designs, contact us by completing and submitting the form below. If you are looking for a specif part number, please include it with your message.